My Next 30 Years: 02-06-2018 The Launch of The Falcon Heavy Road trip! 02-06-2018 The Launch of The Falcon Heavy Road trip! After driving 12 hours to FL just to see the rocket sitting on the launch pad my desire to see its actual launch was multiplied by 100000000000000%. After the successful Test Fire Elon Musk sent out a tweet that the launch would be "in a week or so." I checked a calendar and tried to figure out when that might be. I thought the fifth was a possibility. Meg and I figured he would want to do it before the 8th when the government might have stupidly shut down again since the earlier shut down had effected his test fire. He wouldn't want this to possibly force a delay in the launch. With that in mind we started looking at work schedules. The 3rd and 4th were supposed to be our weekend off. Now in retail weekends are really important because you don't get many off (one a month at our job). Not only that but this was Super Bowl weekend. We had previously requested Monday off because we planned on having a Super Bowl party. Well we let our friends know the party was cancelled and then swapped the weekend for Tuesday and Wednesday off. Thursday we would have to be back at work by 10am. 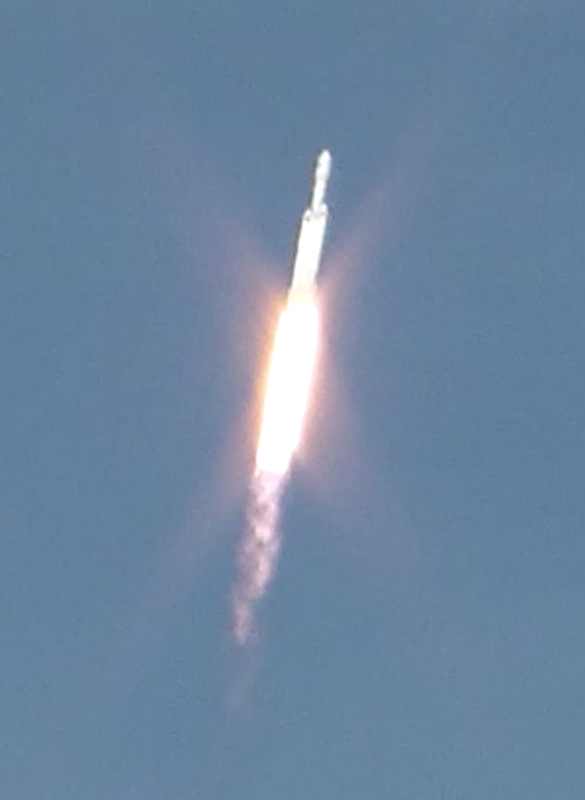 That gave us as much time as possible to see the launch. Next was figuring out where we would see it from. 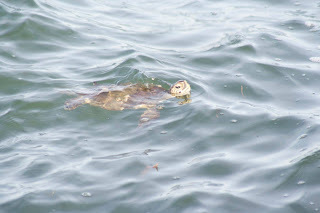 We had explored Titusville and Space Walk Park and had driven around the Wildlife refugee. But for this historic launch I really wanted to be some place with experts: people who would be able to give us info on the process, what was happening, where to look, and what to expect. So I went ahead and spent the money to buy tickets to a viewing spot at the Kennedy Space Center. I bought tickets to the "Closest Viewing" Area. We had missed "Feel the Heat" which would have had us a mere 3 miles from the launch but was out of my price range anyway, though Meg was willing to buy them until she saw it was sold out. But, man, those folks that got those tickets were lucky! "Closest" had us 7 miles away from the launch pad on the lawn in front of the Atlantis Display building. It would get us a commemorative item and buffet lunch provided. Plus someone on hand to direct us and provide info like I had been hoping. Also obviously we were allowed parking at the Space Center and 2 days admittance. 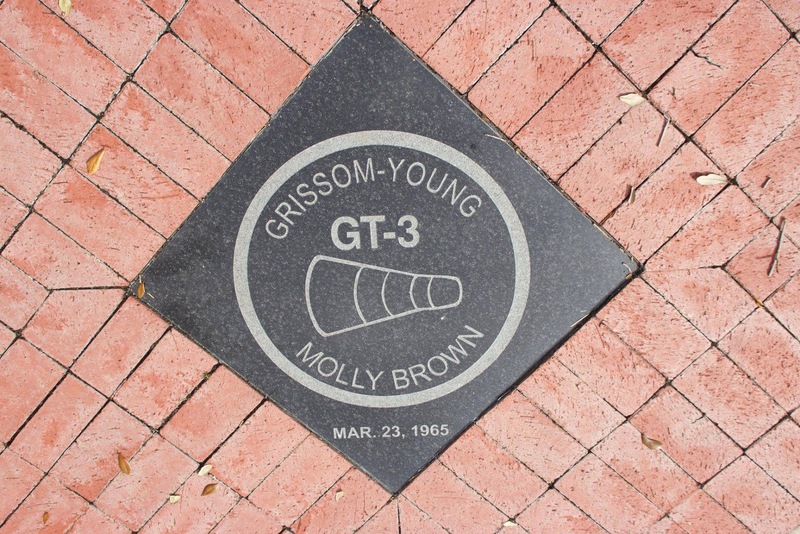 KSC understands the packrat in my soul because on the back of the parking placard they politely informed me that I could keep it as a souvenir :-) to which Meg and I both responded "you don't have to tell me that!" It was January 26 when Chris from NASA Spaceflight somehow got the word earlier than anyone else and tweeted out that the launch date was Feb 6th with the 7th as a backup. Our planning had worked we had the right days off and we were ready to go. We just needed the day to come. And it came quick. Before I knew it Super Bowl Sunday was here and we planned to leave directly from work, like we had done the last time. In the morning we packed the car up with everything we would need which for a trip like this: which was a lot of really cool equipment. Meghan had a tripod and her trusty Canon rebel. She brought several lenses including her "super zoom" which gives her a magnification up to 300 and her fish eye lens. I had a tripod and my new binoculars. I also had a monocular that could attach to my i-phone and just a regular video camera. The goal was to have options for how we wanted to record this event. After work it was basically half time in the game and the roads were pretty clear as we started south/east. For Sunday night the goal was just to drive as long as I felt comfortable and then pull over and sleep for a few hours. We didn't have very specific plans for Monday but I wanted to arrive around noon. I was concerned that there would be a lot of other people traveling for the launch and so I didn't want to get stuck in traffic. I forget exactly how long we drove but I know we were through most of Georgia when we finally took a rest. One of my coworkers asked why we were driving rather than flying and I told him it was much cheaper to drive. See Meghan has a hybrid Ford C-max and I want to say the whole trip only cost about $160 in gas. The other benefit of having the car was that it served as our hotel room for trip. I told Meg we should rename her car, currently called Ice, to the Hab but she sadly declined. I don't know why but the rest stop we pulled over at had all the lights off. Which is probably a little unsafe and generally not my normal experience but it made it a great spot to sleep. When we finally got up we decided to drive for about an hour and then pulled over at exit 101 off Highway 75 for breakfast at Chik-fil-a. Then we were a hop, skip, and a jump away from FL. We reached Titusville at around noon. First we went back to Space Walk Park because we hadn't actually gone through the whole park last trip only the Mercury memorial. Now we saw the Apollo, Gemini, and Space Shuttle memorials. 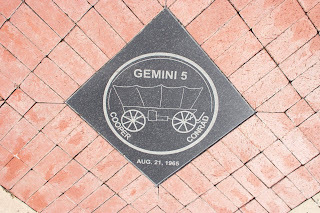 Along the walk way are tiles for each of the various launches. These are two of my favorites. 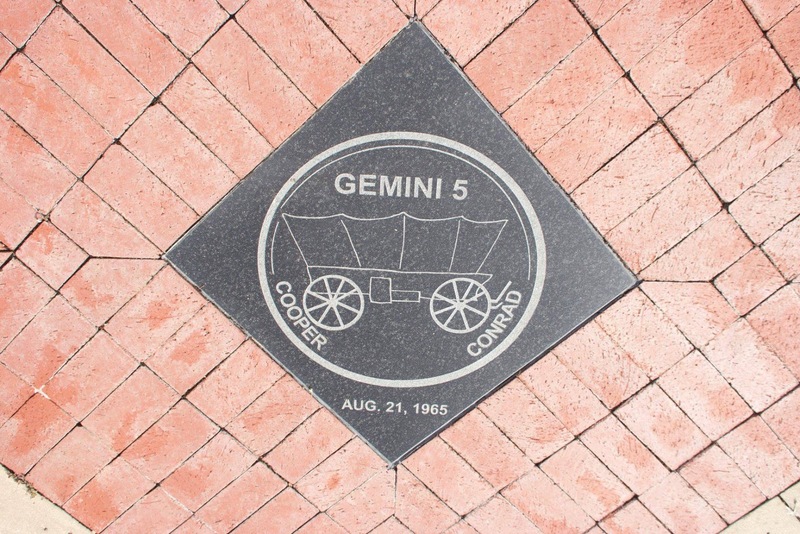 The Gemini 5 covered wagon pays tribute to the desire for exploration that caused settlers to travel across the United States. Meghan got to play with her fisheye lens for this shot of the statue of Kennedy in front of the Apollo memorial. I can only imagine the joy and pride it gave many Americans to hear his speech telling us we were going to the moon. I love the idea of choosing to go to the moon even though it is hard because we choose to do it. It is a beautiful speech to read and to hear. The challenge was hard but it was the one we wanted. And the challenge was met. Talk about doing anything you put your mind too. He put the best minds in several fields on the task. They did what some doubted could be done. Think about that the next time you face a challenge someone says can't be done. Because that is what they said about putting a man on the moon and they were wrong. And that's what they said about rockets re-landing themselves and they were wrong. We went to Jetty Park at Port Canaveral to see the beach. I have to say, and this surprises me, I miss the ocean. Its not that we went often but we had the option when we wanted too. A landlocked state makes it harder. I remember right before Meghan moved we went whale watching off Montauk. At one point we were leaning on the rail and remarking to each other that "we were going to miss this." Another patron asked how often we went whale watching. And we said we hadn't been since we were little. He was confused and said, "well then there isn't anything to miss." That missing something implied you did it often. I disagree. I guess maybe knowing I could go anytime was comforting. At Jetty Park I set up my binoculars on the tripod just to play with them and look around while Meghan took pictures of the wildlife. 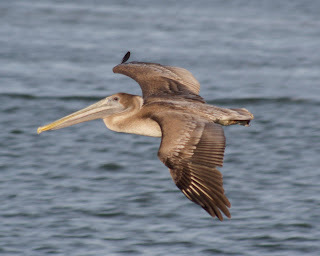 I was just having fun bird watching or looking at the cruise ships and fishing boats in the distance. It gave me a good chance to get more comfortable with them since I had only used them a few times. At one point I attached my i-phone to the binoculars to see how well the attachment piece worked. It took me a bit to get it lined up correctly but I got it and I look forward to doing the same thing with my telescope eventually. Maybe at some point I can get some pictures of Saturn, Jupiter and Mars. Apparently around 5 or 6 is when all the brown pelicans start flying inland for the night because they kept coming in waves of 8-10. And they flew in nice and close for Meghan. And then there was this little fellow who kept popping up and down. 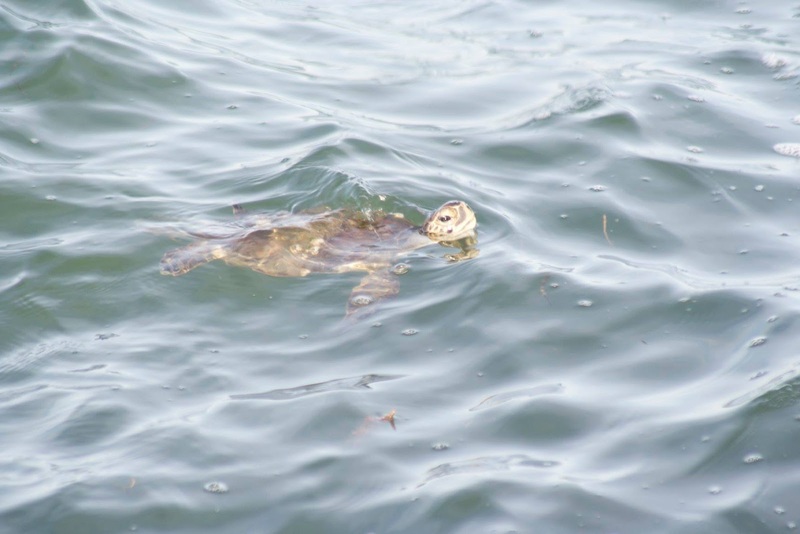 It was a little boy excitedly calling to his parents that he had seen a turtle that made us stop where we did and set up. We did end up moving a bit down the boardwalk when another boy who was fishing said he had seen two come up. They certainly were elusive but Meg is a good photographer and managed to catch them a few times. When it was getting dark we started thinking about finding something to eat and so left Jetty Park. As we were driving away we saw Peacocks crossing the road. So I had to stop so Meghan could get some pictures and she got some marvelous ones! Now I discovered something very important at this moment. 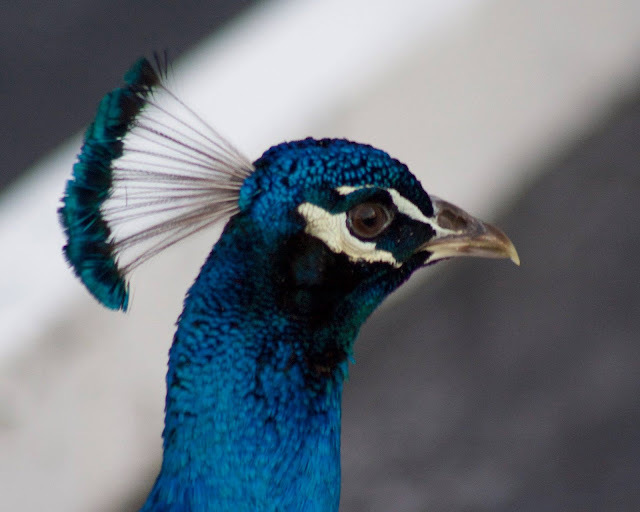 I have seen peacocks before, but never loose. 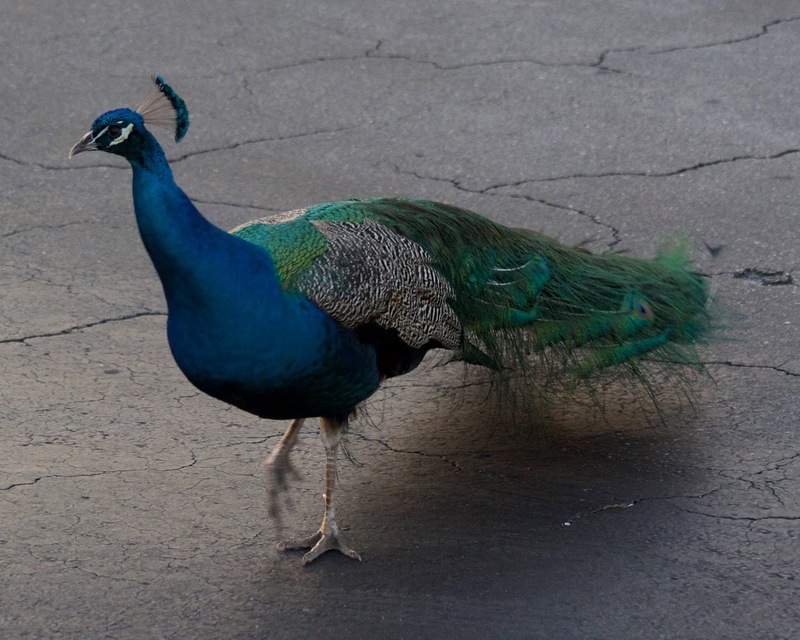 Well apparently I have an innate fear of peacocks. I pulled over and Meg got out and started taking pictures I began walking around looking at the beautiful birds. Then one started walking towards me. Not aggressively, not even on purpose, he was just eating and walking. I know that. But I ran! I ran back to the car got inside and closed the window. Eventually I got out again but if they started coming towards me I was gone again. I don't know it's not like the feathers were up or they seemed annoyed but I am apparently terrified of them. Once the photo session was over we decided to head back to Port Canaveral to the Florida Beer Co where we had done some sampling last trip. When I walked up to the bar the bartender smiled and said "welcome back where is your friend!" Which basically cemented the fact that whenever I go to see a launch in the future I will be stopping by their brewery. Nothing better than being recognized. We each had a pint and we ordered pizza from a local pizzeria, Zarrella's. The pizza was good but I wish I had asked them to make the crust extra crispy. One thing I noticed was that everywhere we stopped people were talking about the launch. 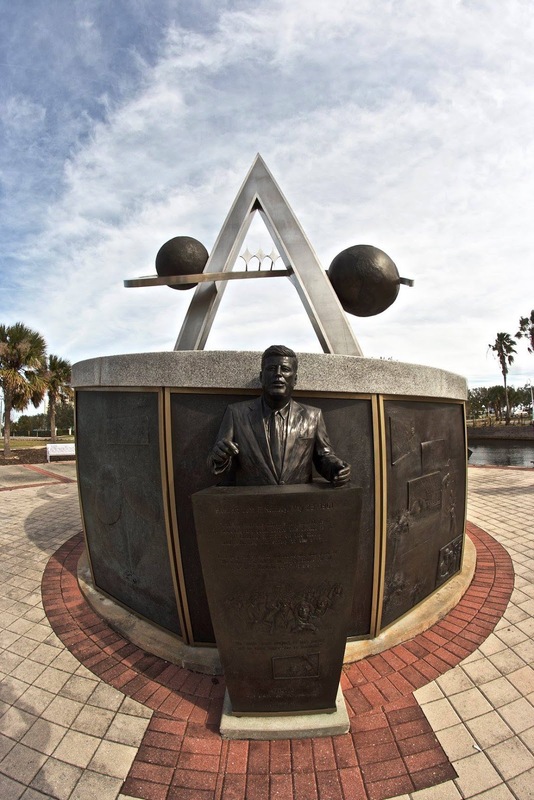 The people at the Burger King, and gas stations, and Space Walk Par,k Jetty Park, and the runners at the Florida Beer Co. were all talking about it and excited for it. It was nice. I had been talking about the launch with coworkers and showing videos of the Falcon 9 rockets re-landing themselves as well as the SpaceX simulation of the Falcon Heavy and now here we were the eve of the launch and everyone was talking about it. Everyone was excited! When we finished our beer and pizza we went to the Cape Canaveral Walmart and parked at the back with the RVs for night two in the Hab. When we went to sleep there were two other RVs. When we woke up there were closer to ten and several other cars had joined our area. We got up before our alarms went off. 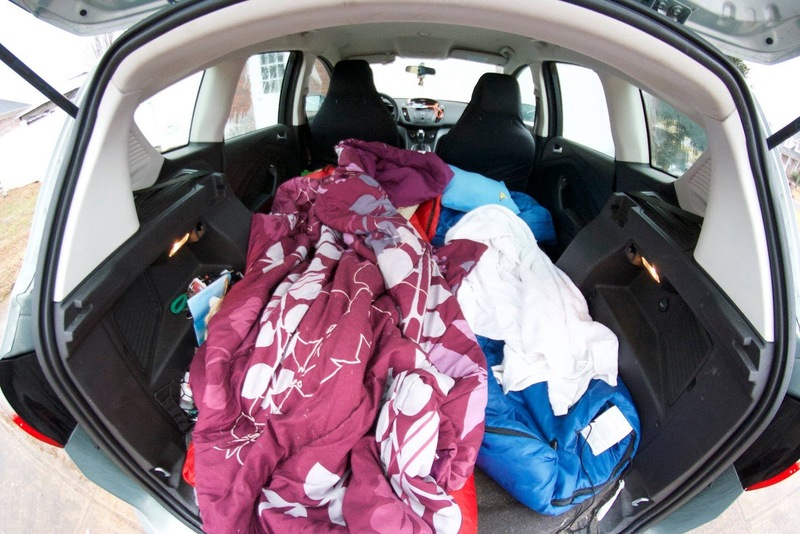 Partly I think because of our own excitement and partly because sleeping in the back of a car is not very comfortable. I left the Walmart and pulled into a gas station that had a Dunkin' Donuts attached so we could get some coffee and breakfast. Then we were on our way to the Kennedy Space Center. Now according to our parking pass we needed to be there at least four hours before launch time which was 1-4. We were on line to park at around 6:30am. And I mean on line behind several cars. The people who had the "Feel the Heat" package had to be there I think six hours before launch mainly because they were going to be boarding buses to take them to their watch site. The line moved fast enough and we had a good parking spot. Now it was time for the real fun! We were at Kennedy Space Center and it was Launch Day! Kennedy opened the gates at 8 and we went inside and straight to our viewing area to pick a good spot, only to find that our viewing area wouldn't be opened until 10:30. We could have gone exploring but since we had just been there we didn't have much to explore and we had all our stuff with us which would have been annoying to carry around. So we started a line for the viewing area. This resulted in a very enjoyable two hour wait. We ended up watching the belongings of one family as they went inside the Atlantis exhibit with their kids. And we were reunited with our parking neighbor who had pulled in to the parking lot just before us. There was also a couple from England and some folks from Texas. Earlier we had meet some people from Germany and even some locals from Orlando. Basically people from everywhere had come for this launch. It was an enjoyable wait but it was a long wait. We checked out each others equipment and I played with the i-phone monocular some more. After seeing some examples of pictures and video taken with a samsung phone and 360 camera I think my next phone might have to be a samsung. Though to be fair I have an old I-phone and I bet the cameras are better now. These photos were taken with the monocular attached to my i-phone. As we waited our parking neighbor pulled up google earth on his samsung phone and we tried to figure out where the launch pad would be to plan a good viewing spot. I was pretty sure I could see the VAB, Vehicle Assembly Building, in front of us which meant that 39A would be a bit to the right of it. We couldn't see the launch pad because of the tree line. When we were finally allowed to enter the viewing area we went straight to the bleachers and set up at the right side of them. There was a large tv screen set up as well as a count down clock. The DJ told us that the rocket should be launched from somewhere behind where he was so we pointed our equipment in his direction. Now we were in for a long wait. The lunch buffet was an awesome awesome taco bar and the commemorative item we each received was a pin that showed the Falcon Heavy and said "I was there." As we watched the count down clock it seemed like every time it got close to going under two hours the clock would jump back up. The launch kept getting pushed further and further back due to high level winds that could cause issues for the launch. The Kennedy Space Center definitely did their best to keep us entertained. On the screen they showed an informational video about the rocket. 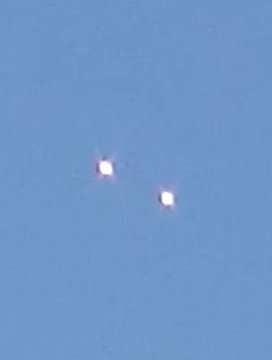 The video included a view of the Falcon Heavy's 27 Merlin engines, pretty impressive. We also had the broadcast of Bill Nye from the "Feel The Heat" viewing area as he spoke about the Planetary Society and sending solar sail vehicles into space. He spent an appropriate amount of time making fun of Flat Earthers as well. And then said, "Space exploration brings out the best in us." And it is so true. It is a result of human creativity, ingenuity, exploration, persistence and more. It is unifying. It is the International Space Station because it is shared. When Neil Armstrong stepped on the moon he talked about 'mankind'. 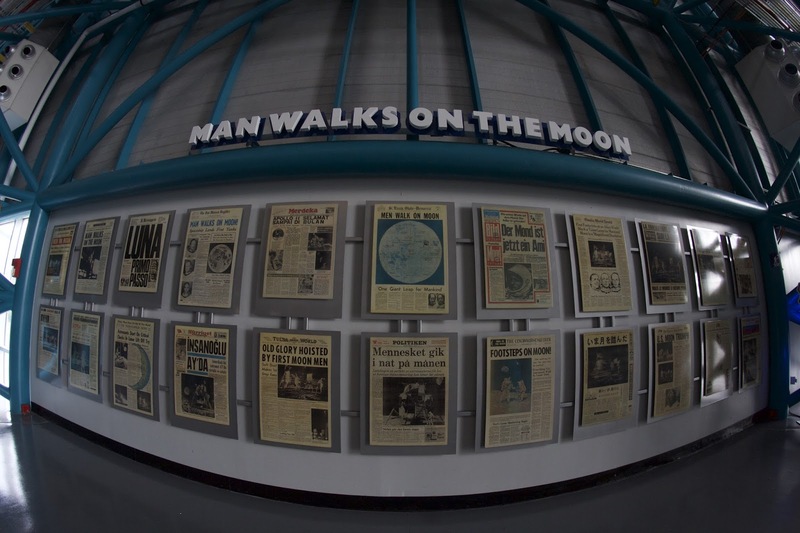 Newspapers around the world celebrated the event. Many of us in the crowd were checking the twitter feeds of SpaceX, Elon Musk, and NasaSpaceflight for updates about the launch. I found one report that had the launch aiming for 3:45 with the last weather ballon going up at 3:30. That was it. If it went any later then we were all going to be doing the same thing again tomorrow. The end of the launch window was quickly approaching and then we got the word: they were fueling up the rockets. A cheer went through the field. Fueling the rockets meant we were getting closer to launch time. And the launch was going up today. You can just hear the beginning of the crowd cheering before I cut the video camera. This was actually really good timing. I had just taken my camera out to check the battery and make sure it was all good. I had my i-phone with the monocular on the tripod but I knew that if it was not lined up right there was going to be no way I would be able to move it fast enough to get the rocket and still enjoy the launch. I had learned that earlier when I was trying to take pictures of the helicopter circling. We were 17 minutes away. Meg did last checks on her camera as well. Others in the crowd began to get ready for the launch checking equipment and getting better position. At this point Richard, our Kennedy Space Center representative got up to urge anyone here for their first launch and even those who had witnessed launches before to maybe forgo the cameras (though he also admitted he didn't think anyone would listen). He told us to take in the experience. First we would see the rocket and then we would hear the rocket. You could feel the anticipation in the crowd. 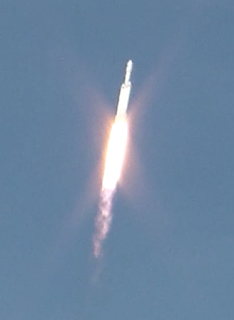 I turned on my video camera again a little more than a minute before launch. The clock we had been watching was about 10 seconds faster than the actual launch clock which caused a funny moment and two count downs. I did kind of listen to Richard because while I was videotaping the launch I wasn't watching through the camera. As a result when the side boosters returned after their initial burn I was able to follow them but you will hear me telling people where to look and that I can see them but my camera could not. The whole video is 12 minutes long but here are some key moments. At 2:14 you will hear the rumble of the Falcon Heavy engines. At 7:52 you will see the rockets return. At 9:39 is when you can hear the sonic boom and the crowd reacts. Over the speakers they were playing the sound from SpaceX launch Command Center. I started by filming the screen to show the progress with a plan to turn to the rocket as soon as it was in view. Now remember how I said we were trying to figure out where the launch pad was with Google Earth. And then we were told it would be behind the DJ (to the right of the screen). Well it turned out our calculations were a little bit better. So in the video you will see us all looking towards the screen and then in the bottom left the rocket will appear. And then it was pure amazingness. The rocket came up slowly as it arched across the sky. We see it come up before we hear it. Then the side rockets separate I catch them real quick on the camera when they do a burn to slow themselves but then they were just two white lines easy to miss against the sky. I was able to watch them come down but I can't see them in the camera at all. But the most amazing thing for me was the fact that the rockets returned and landed and were sitting stationary before we heard the sonic boom and their engines. I have never ever experienced such disconnect of sound and visual before. Fuzzy screen shots from my video of the launch and two rockets returning. 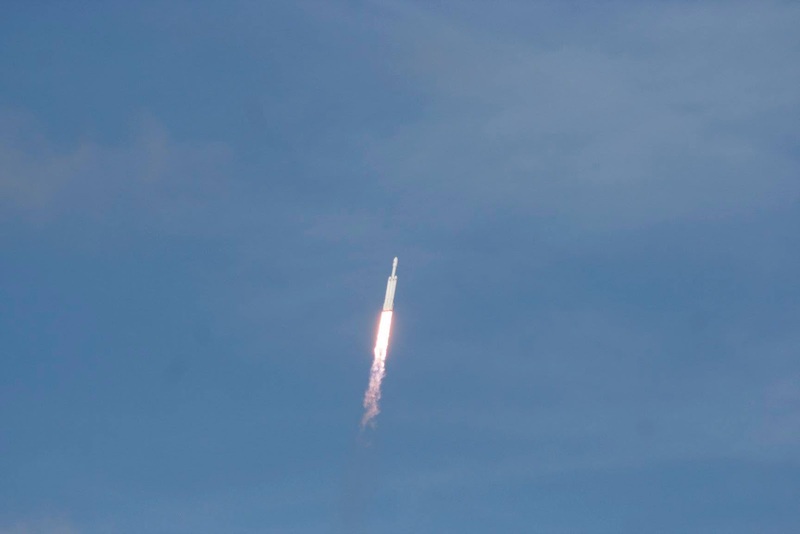 Meghan's shot of the Falcon Heavy with her Canon Rebel and 300 zoom. And like that it was over, 12 minutes of pure wonder and joy. Except it is almost two weeks later and I am still thinking about the launch. It was historic and we were lucky enough to have witnessed it. This launch is the promise of so much to come in space exploration. Like the Apollo launches before it this is a new era. SpaceX is preparing for Deep Space exploration and reaching Mars. To me it has become a moment that years from now I will be able to look back at proudly and say I was there. I will remember the details ingrained in my photographic memory. It joins the Total Solar Eclipse and David Cone's Perfect Game as special moments in my life. Also I can't not mention the fact that Elon Musk launched his car into space, making the Tesla the fastest car in the universe. Now I have seen some people complain about 'space junk' and it being a gimmick. But hear me out, or read me out, on this if that gimmick got a few people who wouldn't have heard about it to care then I think it is worth it. And there was always going to be space junk. If it wasn't the car it was going to be a chunk of concrete. And the car did turn heads. It made people stop and pay attention. 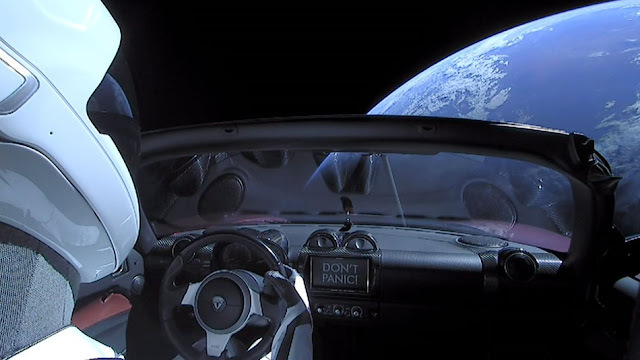 And also Starman floating around the earth in a red Tesla roadster is an awesome shot. Musk in an interview commented that you know it's real because it looks so fake. We have better CGI then that. It was fun and it got attention. And now it was time to head home. I looked up a few points of interest to see on the way back to break the drive up a bit. The first was a Veteran owned brewery in Jacksonville called Veterans United Craft Brewery. We stopped for a bit had a pint each and brought a growler of their Scout Dog 44 home with us. We drove for a little longer and then slept again before continuing to Americus Georgia where at a small airfield there is a statue honoring Charles Lindbergh wing walking. It was still dark when we got there and wasn't well lit. I think we surprised one employee who was pulling up to the main building. 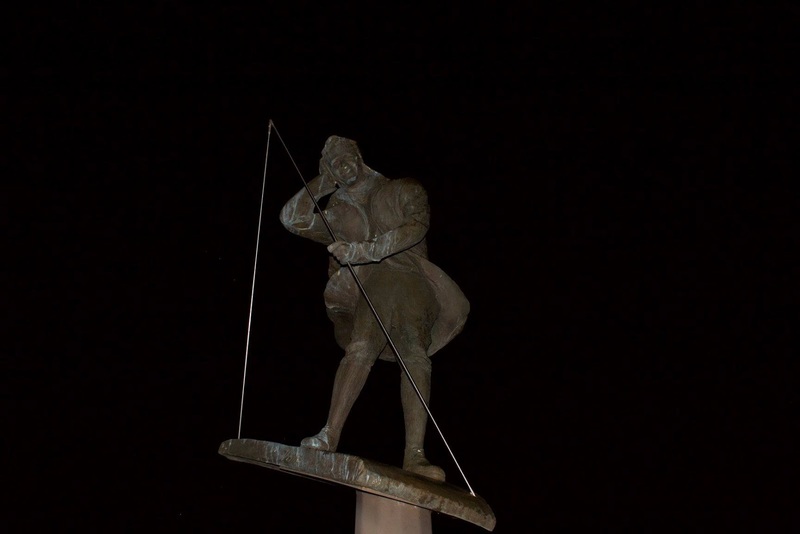 He saw us at the statue and asked if we needed help. We told him we had just come to see it and he said ok and finished going down the drive way. I guess not many people take the detour or most have the good sense to get there during day light hours. From there we were headed to Kennesaw, Georgia to see where "the General" was kidnapped. 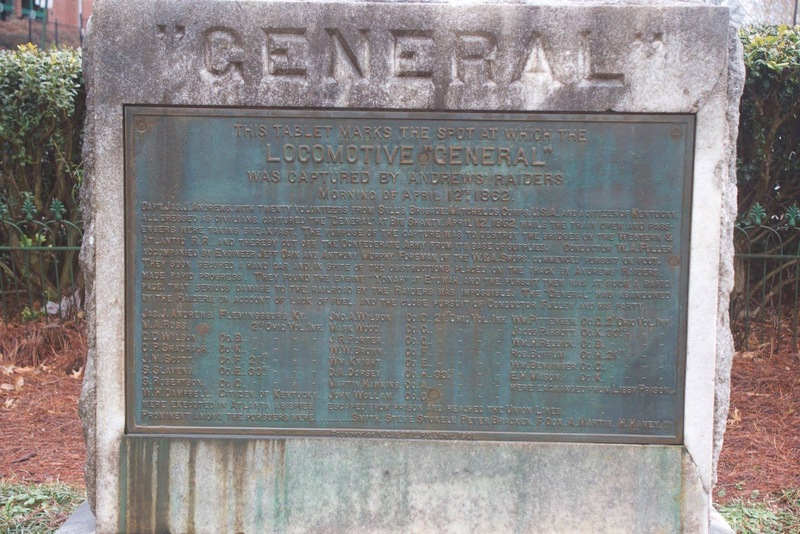 Now maybe I learned about the General in school and forgot about it or maybe it never really got mentioned but apparently 22 union soldiers during the Civil War slipped behind enemy lines and stole a Confederate train and began trying to ride it north to the Union Side and destroy tracks as they went. The plan didn't work as they were pursued by the train's conductor William Fuller. But they did almost make it to the Union side. If not for Fuller's determination they may have been successful. 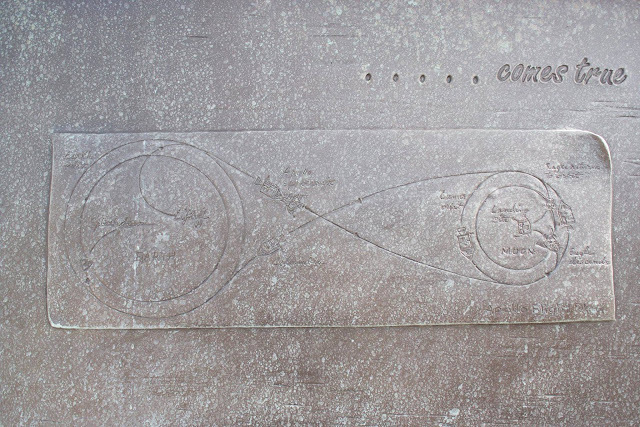 There are matching stones marking where the General was kidnapped and where it was recovered. 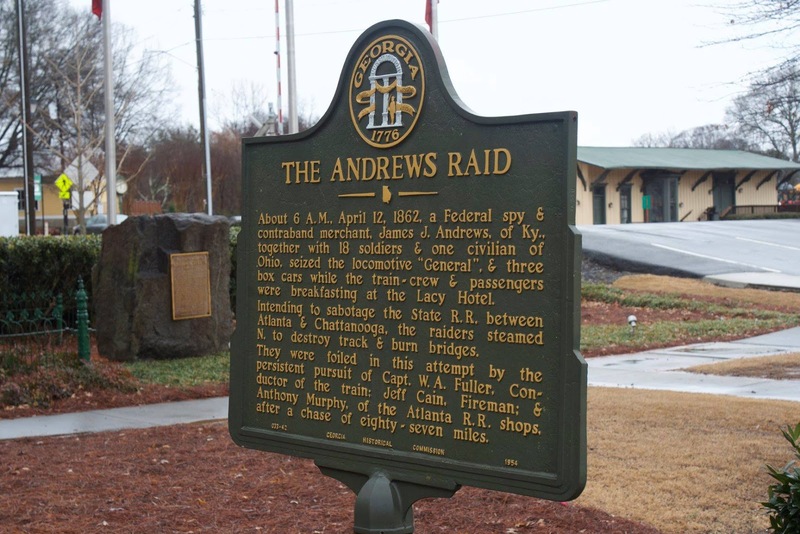 The chase covered 87 miles from Kennesaw to Ringgold Georgia. 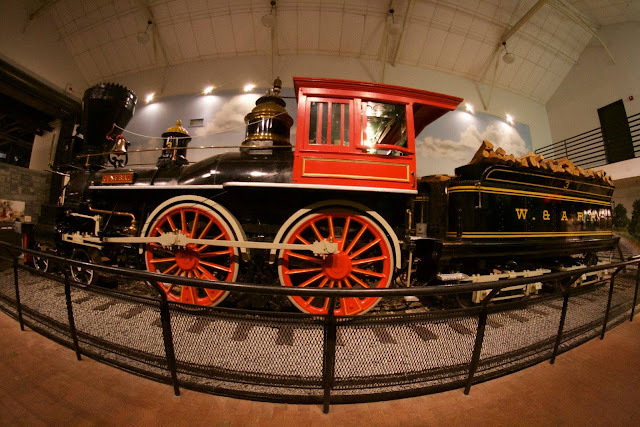 Originally we were just going to stop at the spot where it was kidnapped and then go straight to were it was recovered but because there was heavy rain we decided to spend some time in the actual Civil War Train Museum located around the corner form where the train was kidnapped. Inside the museum was The General. 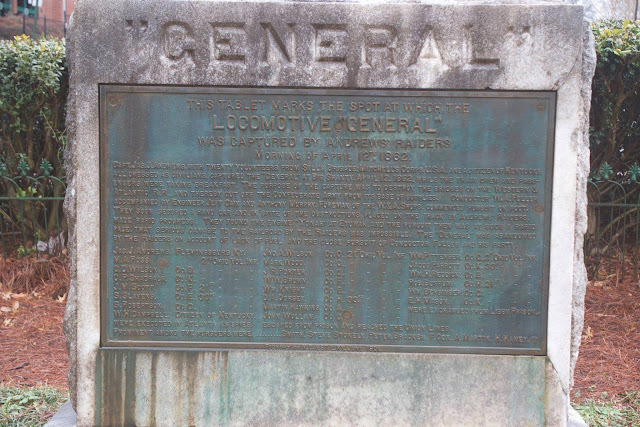 I need to learn more about the Great Locomotive Chase because there is nothing better than a good behind enemy lines story. And the focus at the museum and on the markers was the persistence of Fuller but let's take a moment here. Twenty men in groups of two or three snuck over 90 miles into enemy territory. Got on to the train as if they were passengers. And kidnapped the train right in front of an enemy camp. Then almost made it to their own lines on the train. It brings to my mind one of the greatest lines in one of my favorite movies when in the Great Escape Roger explains that it is his job to "harass, confound, and confuse the enemy." I think the best thing about finding random places to stop and look at roadside attractions around the United States is the growing list of random towns that I know in different states. Basically I'll eventually have a lock on US geography trivia because of researching towns and points of interest. And then we drove over the mountains of Chattanooga and took highway 24 all the way home.